Jekyll and Hyde, Torvill and Dean, egg and chips (my thoughts are never far from food). Whether it’s a really obvious pairing or something a little more obscure, that moment you hit upon the right combination, you know it immediately. 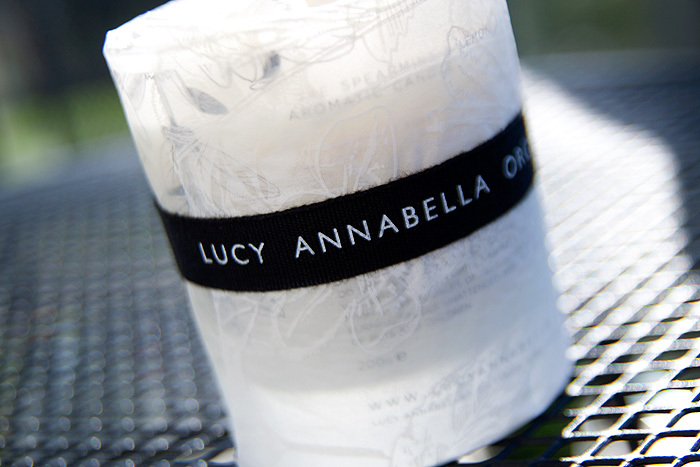 I wasn’t sure when I first read about the Lucy Annabella Spearmint and Lemongrass candle combination. I anticipated that both scents intertwined would create something too fresh, too tingly and perhaps a touch too medicinal for a home fragrance. Oh, how wrong was I? I can only imagine how tricky it must be to get the balance just right when it comes to fragrance, whether it’s in perfume, bath oils or candles – one addition too many and the entire concept goes down the pan. There are a million tried and tested home fragrance combinations out there, featuring some of the most popular scents around and this one instantly appeals for not taking the path of least resistance. Spearmint and Lemongrass, you shall go down in history as the Bonnie and Clyde of fragrance combinations. You’re badass. 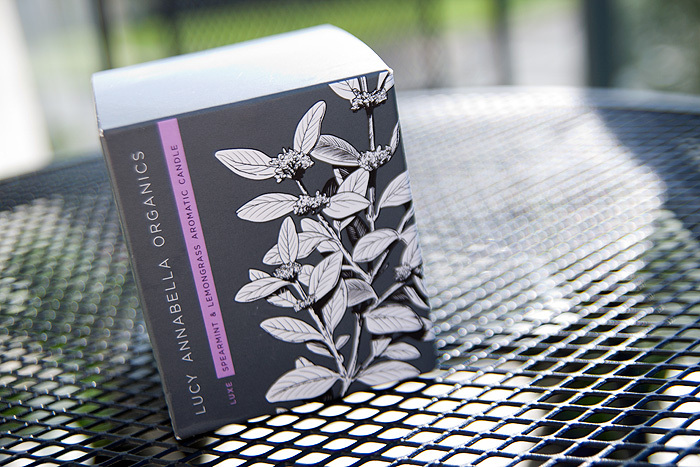 The styling and packaging of the Lucy Annabella Organics Candle, however, is not badass. It’s perfectly presentable – beautifully wrapped in tissue paper and ribbons, housed in a delicately patterned tumbler which will sit demurely wherever you place it. 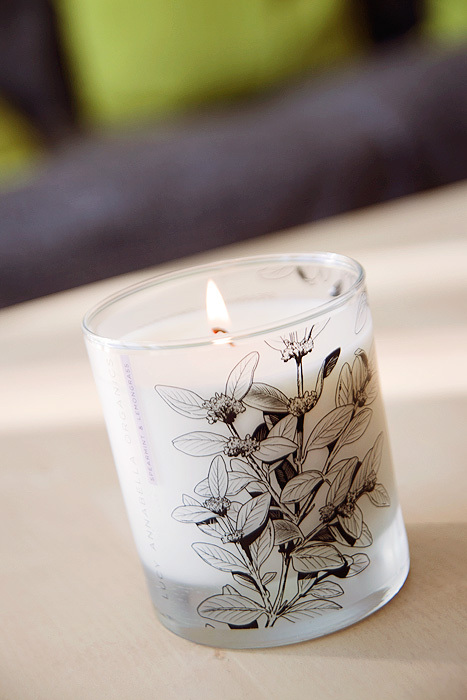 The 100% soy candle burns cleanly and will last for up to 50 hours, the scent is invigorating but not too refreshing, neither is it ‘kitcheny’ – I light this in my hallway while I’m getting Leila ready for nursery and it perfumes the whole flat (ok, so it’s not a mansion!) within the thirty minutes it takes to get us out the door. I can still smell it upon my return, even though the flame has obviously been long extinguished. Candles are one of those frivolous purchases that in today’s tough times, we can frankly do without. They’re a luxury, not a necessity and I have a couple of brands that operate at a lower price point to the ‘luxe’ big names that I will happily buy for a big treat for myself or a present for others. Neom for wedding gifts (they look so posh! ), Ancienne Ambiance for myself when I’m being naughty (scent divine), and with the exquisite packaging on these (and sub £30 price point) – I’ve found a new general-but-special gift, you know…. mother-in-laws, nans and the special ladies in our lives! What is your favourite home scent combination? I must admit, if there’s one thing that induces guilt in a “I’m spending money on something that will go up in flames” kind of way, it’s candles. It’s like that time I paid for a balloon release at my wedding. It was super-windy… they were gone in literally, seconds. My brother ripped the piss out of me and said I should have thrown the money up in the air. But at least candles smell better. And they make my mother-in-law like me. the wrapping and the design on the glass is to die for. wow!